All transactions are safe and secure with a reliable history in online purchasing behind each of our associates. Buy the Rambo 4 Stallone t-shirt to own Rambo clothing and merchandise. 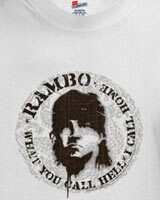 This white Stallone Rambo 4 t-shirt was released in conjunction with the 2008 Rambo movie. The design on the front displays a dark, ink-dripping silhouette image of Sylvester Stallone as John J. Rambo. The phrase, "What you call hell, I call home" is printed around the image. Embrace the hype in the this comfortable studio T that's perfect to relax in as you sharpen your First Blood Rambo survival knife, because you never know when Colonel Trautman will need your services. In addition to the Rambo 4 Stallone tee above, browse the Rambo Clothing Gallery for more apparel like men's and women's clothes, kids shirts or hoodies.